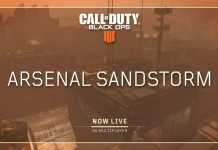 Another update for Call of Duty Black Ops 4 has been released. The new update has fixed many bugs, improved stability and also enhanced the performance of the game. 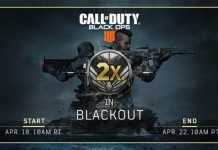 In the Duos playlist, the Blackout Players will now feature 100 players while the Quad playlist only supports 88 players currently. General stability improvements and crash fixes. The Featured playlist tiles for Multiplayer and Blackout have changed today. This is part of the regular rotation of Featured playlists – more details to come on how Featured playlists will work in Black Ops 4 in a separate update. 100-Players Duos is now the Featured playlist for Blackout. Quads playlist is now 88 maximum players. We’re continuing to update various game settings to ensure the best experience for all players across all platforms and modes. TDM playlist now supports parties of 6 (was previously 5). Featured playlist changed to Heist. Custom Search and Destroy games will now correctly conclude after one team wins 6 rounds total, fixing an issue where custom games previously ended at round 7. Addressed a crash caused by earning multiple Medals in a match. Addressed a UI error caused by losing Internet connection in split screen. Fixed a crash occurring during initial boot of the game for some users. Fixed a crash when disconnecting from a Blackout match. Fixed a crash occurring when managing multiple windows simultaneously in Blackout. Fixed a crash when browsing unlockable Items. Fixed crashes occurring when changing texture quality. Fixed a performance issue when changing Clan tags. Improved handling of “Out of Memory” errors. Addressed an issue that caused Hellhounds to exhibit some very… un-doglike behavior in Zombies. “Object View Distance” setting now properly renders objects further on “High” than on “Low” in Blackout.